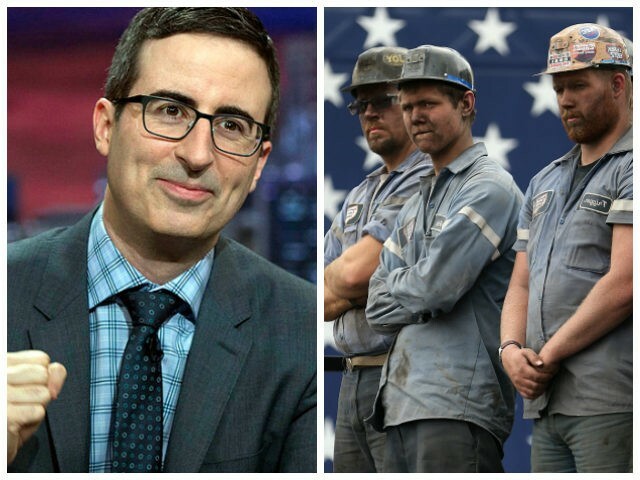 Last month, HBO funnyman John Oliver spent an episode of his show Last Week Tonight delivering a profanity-laced rant demonizing coal, coal-energy advocates, and presidents of the United States who don coal-miner hard-hats. He did so following the formula that Jon Stewart has used so successfully throughout his career: Be witty and quote a lot of apparent facts in order to back up your satirically-expressed opinion about any issue and hope your audience will accept you as an expert. If nobody manages to have a voice loud enough to prove that your arguments are seriously flawed in the court of public opinion, you can relax. You’ve won. If somebody does manage to expose your errors in a meaningful way, you can always fall back on the escape hatch labeled: “Hey, I’m just an entertainer! I never claimed to be an expert on this stuff! Chill out!” Everyone criticizing you is thus a hyper-sensitive fuddy-duddy. You’ve won. Oliver’s coal rant was so full of misrepresentations, exaggerations and confusion that I could probably burn half a dozen columns explaining them all. But, in all fairness, let’s start with something that Oliver actually got right: EPA Director Scott Pruitt’s deceptively-worded claim that 50,000 jobs have been “created in the coal industry” since President Donald Trump took office. Pruitt didn’t actually phrase it that way. He referred to jobs in the “coal and mining sector,” which is technically correct but way-too-misleading a descriptor. Fifty thousand new jobs in the energy sector have been created since Trump took the oath of office. But the vast majority of those have been in the petrochemical portion of the energy industry, whose activities can only described as “mining” if one applies an exceptionally broad brush. Oliver never explicitly says that, but it’s clearly a prominent subtext of his rant. Even the Kentucky Coal Mining Museum has gone solar! (Not really, but more on that later). Solar energy has its uses, but they are very limited and localized. Large-scale energy production using solar energy is completely infeasible for a variety of scientific reasons, including: the Sun doesn’t shine all the time, the energy-density of solar power is extremely low, clouds exist, storing energy – aside from hydraulic pump and store operations – are horrendously expensive, and a bunch of other scientific and economic realities. Energy to be produced in the United States in 2017: fossil fuels, 77.4 percent; nuclear, 9.5 percent; hydro, 2.9 percent; renewables, 8.6 percent; other, 1.5 percent. Energy to be produced in 2050: fossil fuels, 76.8 percent; nuclear, 6.1 percent; hydro, 2.9 percent; renewables, 13.6 percent; other, 0 percent. This is not evidence of a hypothetical renewable wave; it’s proof of the reality of a renewable trickle. 1. The Obama-era EPA adopted air-quality standards so incredibly stringent that no new coal-fired power plant could affordably meet them, and many an existing coal-fired power plant chose to shut down rather than add all the equipment that would be necessary to meet them. These air-quality standards are so stringent that if they were applied to ordinary citizens, they would prevent anyone from burning wood in a fireplace, operate a backyard barbecue, or have a camp fire. EPA knows enforcing such standards in your backyard would be very unpopular, so it hasn’t gone down the residential route –yet. 2. The Obama-era EPA promulgated new rules requiring older, less-efficient coal-fired power plants to install so much control equipment that it made more economic sense to retire those assets than to retrofit them with new technologies that are marginally more effective but much more expensive. 3. Environmental NGOs like the Sierra Club and the National Resources Defense Council effectively gamed the permit system, submitting thousands of public comments and Freedom of Information Act requests that regulators were legally-bound to respond to. The sheer volume of those comments and information requests delayed projects (at best) and killed projects (most often) that would have resulted in the installation of new, modern, more-efficient, and cleaner coal-fired assets that would have replaced older units in a healthy, unfettered free market. The Kentucky Coal Mining Museum is Solar-Powered. How’s That for Proof of Concept? The Kentucky Coal Mining Museum says that it installed 20 solar panels. The high end of solar panels delivers about 345 watts per panel in ideal conditions. So, 20 x 345 = 6,900 watts of generation capacity. According to EIA data, the average household in Kentucky needs about 42,000 BTUs per square foot of living space to go about its business. I imagine the energy use for a museum would be greater than this, but let’s use that figure as a benchmark. Using Google Earth as a source, the Kentucky Coal Mining Museum is a three story structure with a total usable area on all three floors of 23,000 square feet. If we use the 42,000 BTU/square foot residential benchmark and apply that to a space of 23,000 square feet, we end up with a total energy demand of about one billion BTU’s per year, which distills down to about 34,000 watts of energy per hour for the museum. With 6,900 watts of generating capacity and average demand of 34,000 watts, the solar array at the Kentucky Coal Mining Museum will never deliver much more than 20 percent of the Museum’s power needs. Given that solar arrays produce no power at night, very limited power when there is substantial cloud cover, and the fact that Kentucky is under substantial cloud cover for about half the year, the solar array at the Kentucky Coal Mining Museum will likely generate less than 10 percent of the power the museum actually uses in a given year. The inherent inefficiency of solar power is surely the reason the Kentucky Coal Mining Museum relied on anonymous donors to pay for its solar array rather than making the economically unsupportable decision to purchase the panels themselves. Bottom line: Entertainers like Oliver are certainly free to make any sort of jokes they want in a free society. We should all be proud of a tradition that gives both the ignorant and the informed voices in the free market of ideas, but when and if we truly want to have an intelligent, adult conversation about important public policy issues like energy resources, let’s stop pretending that being a comic makes one – in any sense of the word – an expert. Some pundits make us laugh. Some pundits make us think. A select few are able to do both. I imagine John Oliver hopes to join the ranks of those pundits who actually managed to pull off both: commentators like H.L. Mencken, Dorothy Parker, William F. Buckley, and, in modern times, Mark Steyn. Oliver’s thoughtless, shrill, and vulgar ravings about the energy sector in America today show that he has little interest in facts or consequences, but he is rather concerned about ratings and laughs. While I don’t begrudge him the latter two, I hope America is intelligent enough to realize that comics like Oliver cannot be counted on as authorities regarding the former. Rich Trzupek (media@heartland.org) is a chemist who has been employed as an environmental consultant to industry for more than 25 years. He is a policy advisor to The Heartland Institute, a free-market think tank based in Arlington Heights, Illinois.